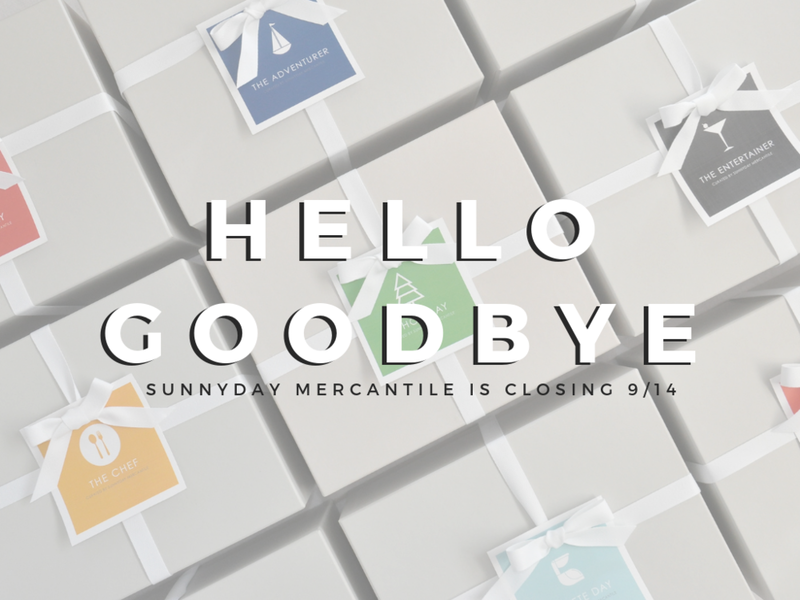 Today I announce that, after three years of gifting, Sunnyday Mercantile will be closing it's virtual "doors" Friday, September 14 2018. This decision has been in the works for some time as plans to move abroad have been bubbling and brewing. Life and Love is taking me to the great North, and I am thrilled to be Canada bound! To everyone who trusted Sunnyday with your most precious gifts, I was honored to curate and deliver your sweet messages of love, thanks and encouragement around the world. To all the makers who partnered with me and provided such beautiful product to work with, I will be forever inspired and influenced by your creativity. To the amazing community who showed up, listened, valued and shared the Sunnyday story, I am a better business owner, friend and person because of your support. Some of my favorite gift items have been added to the online shop and this week you will have the opportunity to score some amazing deals on the last bit of inventory we have in stock. Sparklers, body scrubs and cookbooks! Put together your own curation for someone special, stock up on your favorites or get yourself something pretty! Go on, you deserve it! You know what else you deserve? A discount! To say thank you for your loyalty and support we are offering an additional 20% off your entire purchase. While I don't know what the next reinvention of Sunnyday will be, I do know there will be one. Until then, continue to check in here on the blog where I'm excited to get back to the roots of where SDM started, sharing stories of the people, places, and things that make life most S U N N Y. It has been my humble honor and truest privilege to serve you. Thank you from the bottom of my heart.